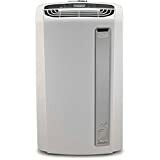 De'Longhi PACAN140HPEWC 14,000 BTU Whisper Cool Portable Air Conditioner Escape from the heat and humidity with some help from De'Longhi PACAN140HPEWC 14,000 BTU Whisper Cool Portable Air Conditioner. With the capability of operating as an air conditioner, dehumidifier, and a fan, so you really will be spoiled for choice.Cools Up To 500 Square FeetThe De'Longhi PACAN140HPEWC is ideal for cooling small to medium size rooms of up to 500 square feet. Absorb the coolness with up to 14,000 BTU cooling power. You also have the choice of choosing from 3 fan speeds, in addition to this, with adjustable air louvers you can choose which direction you want the cool air to go.Special Features IncludeNo drip technology 24 hour programmable timer Washable air filter Window bracket and hose included LCD display Adjustable themrostat Auto fan functionCompact & PortableCrafted and designed into an incredibly compact size, De'Longhi's PACAN140HPEWC is small, compact and easy to move around with its four caster wheels and side handles. This fully portable unit requires NO installation process. Simply remove it from its packaging and start cooling. This unit is also ideal for areas short on space such as apartments and offices.Eco-Friendly R-410A RefrigerantComplete with an R-410A refrigerant, this AC unit is very environmentally friendly. Providing improved cooling and lower energy consumption, De'Longhi PACAN140HPEWC 14,000 BTU Whisper Cool Portable Air Conditioner will keep you cool while minding the environment. Adjustable thermostatThis AC offers an adjustable thermostat, LCD display, and an electronic control panel. It's easy to operate, offers 3 fan speeds to choose from, and an exclusive condenstae recirculation system. This feature allows for continuous operation without excessive condensate build up. De'Longhi PACAN140HPEWC Whisper Cool Portable Air Conditioner 3.8 out of 5 based on 48 ratings.